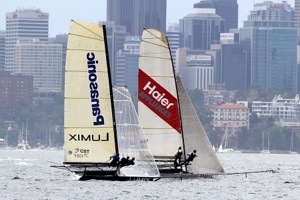 Today’s 18ft Skiff race on Sydney Harbour was both Race 2 of the NSW Championship as well as the concluding race (brought about by last week’s postponed race) of the AEG 3-Buoys Challenge series. Provisional results at this time have Lumix (Jonathan Whitty, James Hozack, Aron Everett) as winner of Race 2 in the NSW title, Fisher & Paykel (Gary Phillips, Ewan Duckworth and Tim Baraclough), winner of Race 8 of the AEG 3-Buoys Challenge and Pure Blonde (Tom Clout, Rob Bell and Matt Wark) the overall winner of the 3-Buoys Challenge. Aside from the provisional results, the rest of the day was something to rember as we were treated to the most unusual finish anyone could remember. While the day in Sydney started out with brilliant sunshine and a nice Nor’Easter, things deteriorated to a point where the race was delayed due to a lack of wind. The fleet finally got away in a light Nor’Easter but a variety of wind pressures and directions kept all teams on their toes over the first two laps of the course. Just when things looked normal and reigning Giltinan champion Gotta Love It 7 (Seve Jarvin, Scott Babbage and Peter Harris) held a 1m50s at the final windward mark, nobody could have foreseen what was still to come. As the champion Gotta Love It 7 team raced under spinnaker to the wind mark off Shark Island, the wind dropped while the rest of the fleet came down to join ‘7’, which was ‘parked’ near the buoy. 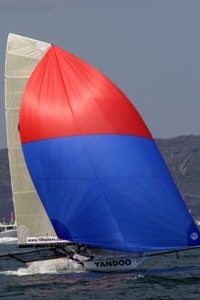 With just the final short spinnaker run to the finish off Double Bay, there were 10 boats all in a single line. Lumix, featuring a radical new wing mast, and Mojo Wine (James Dorron, Ricky Bridges and Mike McKensey) were the first to pick up the new breeze and resulted in Lumix taking the honours by 18s. Third place went to Yandoo (John Winning, Andrew Hay and Jim Beck), which finished a further 11s back. 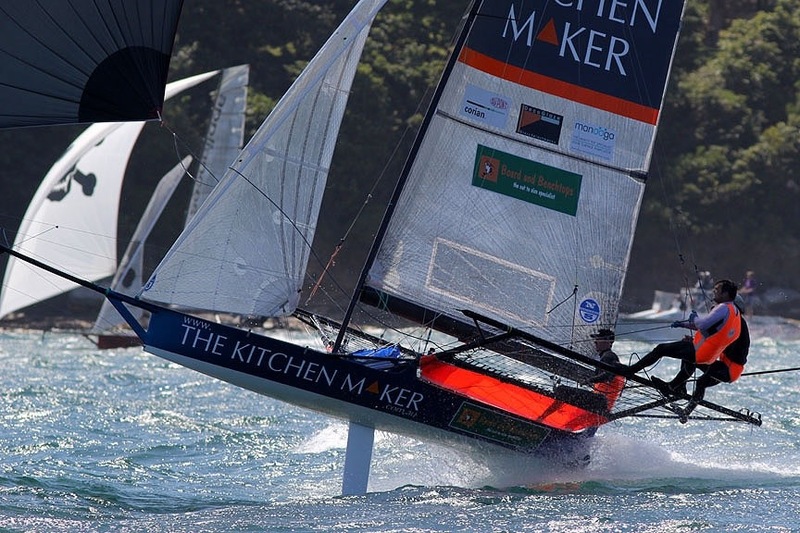 These placing are provisional as the Appliancesonline.com.au team have lodged a protest against the winner over an incident at the critical final wing mark. Early in the race, Coopers-Rag & Famish Hotel (Jack Macartney), Appliancesonline.com.au (Micah Lane), Mojo Wine and Gotta Love It 7 staged a tough battle to the first windward mark. 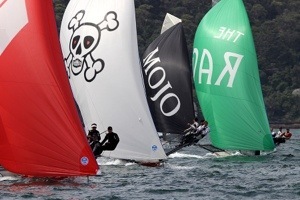 AOL and ‘7’ went around together, closely followed (5s) by The Rag, with Mojo another 10s back in fourth place. The breeze had a lot of north in direction and all teams were forced to gybe a number of times to reach the wing mark. Gotta Love It 7 had edged slightly away from AOL and Coopers-Rag & Famish Hotel, while Australian champion Thurlow Fisher Lawyers (Michael Coxon) had time to be in fouth position. A slightly fresher breeze settled in over the next lap and Gotta Love It 7 increased her lead from AOL and Yandoo. Six photos and today’s result sheet are attached. Spectator Ferry photos will also be published on http://www.18footers.com.au and http://www.flying18s.com during the coming week. There will now be a three weeks break from racing. 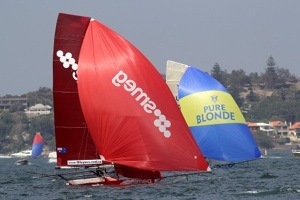 The season will resume on 13 January with Race 1 of the Australian Championship. 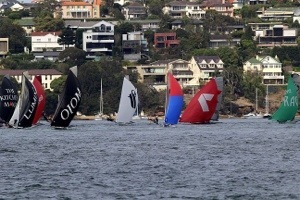 The club’s regular spectator ferry will follow each race, leaving Double Bay Wharf at 2.15pm. 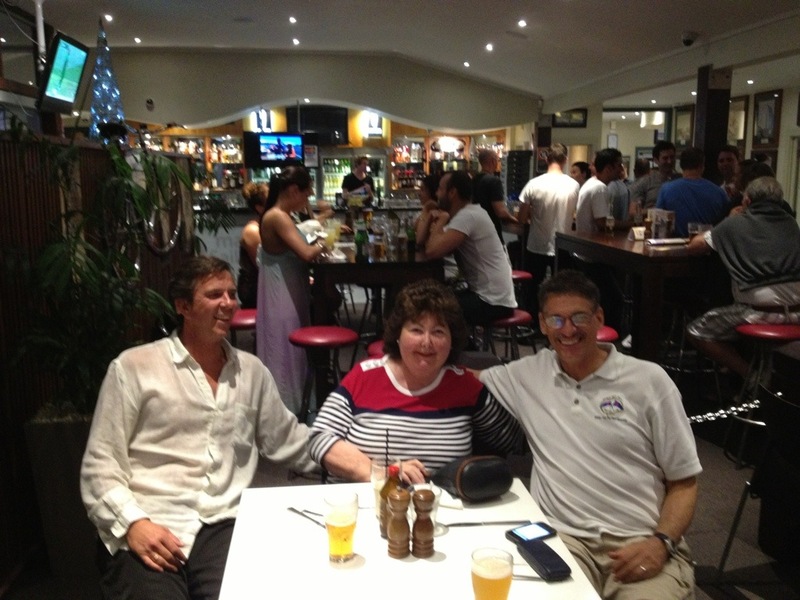 Beancounters 16 foot skiff racing team celebrate at the skiff club after racing. 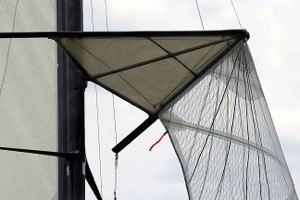 Green and Gold Sailing published a good article on 12 foot skiffs and the Harsco Infrastructure 53rd 12ft Skiff Interdominion Championship 2013. 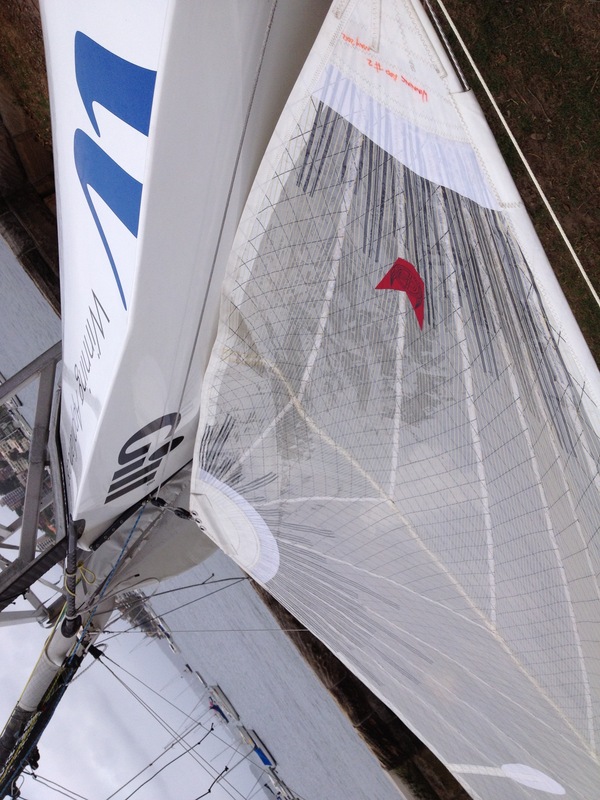 Good day sailing a 12 foot skiff with Cam Gundy at Lane Cove in plenty of breeze.